This clock is in Marie Antoinette’s private residence. 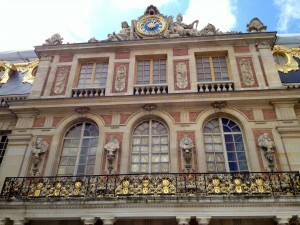 Today we left our hotel in Paris and headed for Versailles. Apparently Versailles receives some 4 million visitors per year but we are privileged to be guided through the site by the head curator of Decorative Arts as guests of the museum. That means that we did not have to wait in line to get in, we did not have to pay for admission, and we did not have to pay for a guide. We also got to go places that the general public does not go and because we are interested in clocks, we were accompanied by the man who has been maintaining the clocks of Versailles for the last 20 years. So, we are getting the real inside scoop as well as getting to meet a man of real importance to the site. Here I am up on the attic of Marie Antoinette’s residence. You can see that it was not a place that visitors usually go. It really is amazing to realize that places like Versailles have been around for hundreds of years and had such a sharked history. It is fun to try to imagine these events taking place and being there. At the same time, I think most people has a pretty tough life – we have so many more luxuries and even the ability to know what is going on around the world and to travel like we can is a great privilege. Bottom line, I would rather be living now than then. Here’s what the Palace clock looks like from the outside. 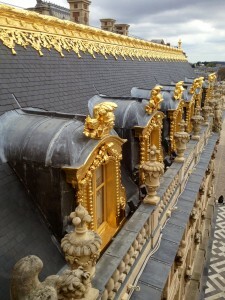 It it hard to know what to pick out from all that we saw – there were many rooms many wondrous things: the amount of gold in some of the rooms and on the outside of the building is overwhelming and striking but it is probably the out of the way places that I liked the best. 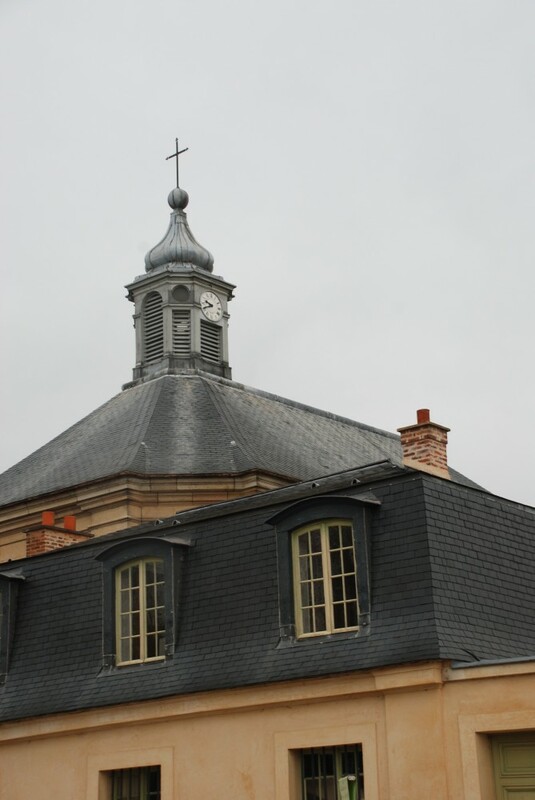 Of course two of those places were clocks places; one was in Marie Antoinette’s “cottage.” It was the clock that is on top of the chapel there. We were obviously in a part of the buildings that no visitor goes be use it was dirty and needed painting. The clock was in the attic of the building with rafters that had remnants of a bird’s nest. Unfortunately, because we were a relatively large group, we did not get to spend much individual time with the clock. The other place was similar, but it was the clock tower for the clock on the main palace. Again, not too many visitors go there but it was cleaner and it was in the kings private area of the palace. we went through a courtyard that contained a very nice sundial or set of sundials. 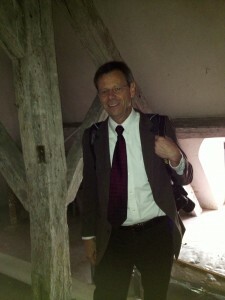 Then we climbed up about five stories of half spiral stairs (very neat) and the saw the clock. We had a little more time with this one but not much. The view from up top was wonderful. 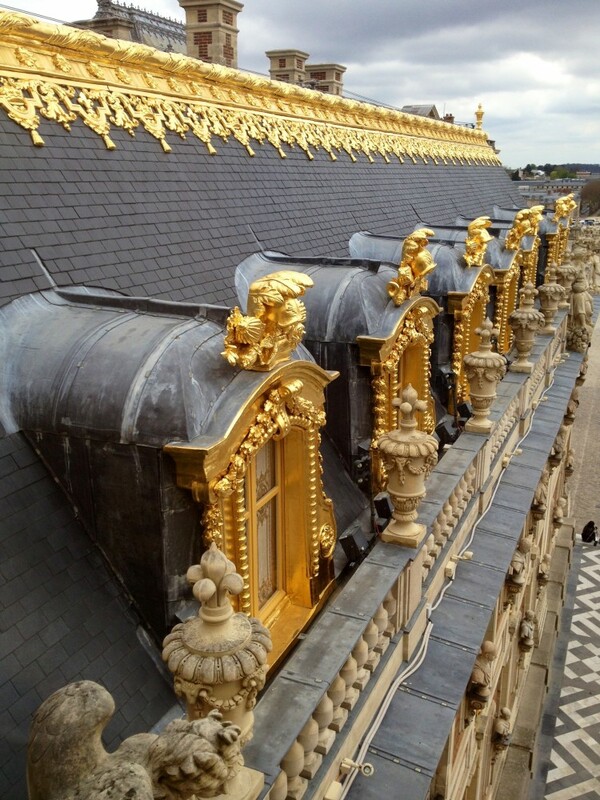 Gold is everywhere, even on the roof! We also went through many stately rooms and saw some very fancy clocks (seems almost every room had a clock). It was hard to get excited about many of them because there wasn’t the ability to get close and personal with them – there were too many of us and not enough time. I would be easy to want to become an architect after seeing places like this, besides all the decorTon, etc., the feel of these mammoth buildings is indescribable. Now we are driving through the country on a long ride to a town called Besancon in eastern France where we will visit a museum, a cathedral, a citadel, and an observatory, all with clocks of course. P.S. I seriously apologize for the quality of all my postings but this one in particular. Unfortunately my knowledge of these things is not great and it is taking an extremely long time to get the pictures loaded and positioned half way decent. I just can’t put even half of the pictures that I want to and I do have to get some sleep. Finally a picture of you, cute!